Julia “Julie” M. Snyder, 100, of Fremont, OH passed away peacefully on Saturday, October 7, 2017 at Good Shepherd Nursing Home in Fostoria, OH. 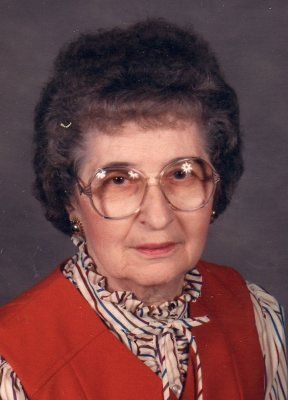 She was born on August 29, 1917 in Norwalk, OH, the daughter of Nicholas and Milka (Torbica) Minich. Julie worked at Clauss Cutlery, as an inspector and in shipping for over thirty years and retired in 1976. She was a member of Grace Lutheran Church, the Fremont Eagles Ladies Auxiliary and REACT. She was also a Chairperson of Union Local 959 Retirees. Julie also loved country music and crossword puzzles. Julie is survived by her children, Patricia (John) Gregg, Fostoria, OH and Robert (Linda) Snyder, Fremont, OH; brother, Donald J. Minich of Leominster, MA; five grandchildren, twenty-two great grandchildren and seventeen great-great grandchildren. A Graveside Memorial Service will be held on Thursday, October 12, 2017; 1:00 p.m. at McGormley Cemetery, Fremont, OH. Sympathies to Julie’s family. We loved the fun Julie and the rest of us had at the card socials we went to. We’ll miss Julie’s laugh and sense of humor. Patti, Our sympathies to you and your family on the passing of your mother. She was always talking about you and your brother. We had fun going to the Eagles and playing cards. I’m glad she’s finally resting in peace. She passed on Lynn’s birthday –they can have their own card games now. Sorry about the loss of your Mother.